December is the perfect time to get together and spend some quality time hanging out with your MINI Club friends. Vendor Liason Taylor has graciously offered the use of his home as meeting spot. UPDATE: 12/01/2005 After the get together, anyone that wants can pile out and take a short cruise to view the holiday lights at the Lincolnwood Towers. This area, bounded by Devon, Pratt, Central and Edens expressway is known for putting on a spectacular light show. The plan is for everyone to just drive around randomly and explore the area. Beeps, waves and flashing headlights are expected when crossing the path of other MINIs! Huge thanks to Bill Jacobs MINI for providing coffee, donuts and bagels and a cool starting place for our drive to Starved Rock!! 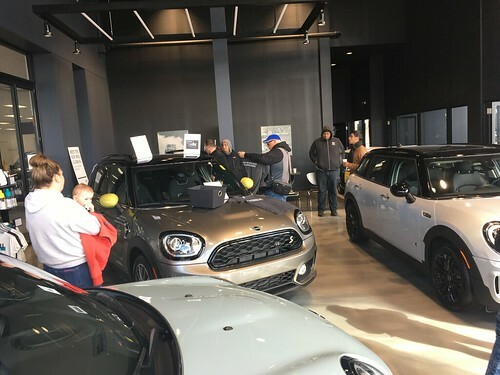 With the help of the Minis in Northern Illinois Club, we had a total of 17 MINIs out for the drive in comfortable late fall weather. There was a bit of traffic in the beginning, but the roads cleared up after Morris as we headed into the twisty bits. I was running cleanup in the rear of the line, and there were times when I could see MINIs heading in three different directions on the same road. The park was much less crowded than last year, and it was no problem finding a good set of parking spots. After a late lunch, some people headed home, some people explored the park, and a few just hung around in the bar. A fun time was had by all. Thanks to Lex and Conrad for organizing this great event!! Gary Kouba, of Perfect Auto Finish has invited members of our club to a free auto detailing seminar. The Seminar will be held on Tuesday November 29th at the Franklin Park Library from 7pm to 9pm. Please call (847) 455-6016 to reserve your seating!! North American Motoring is offering our club a discount on the new 2006 Calendar of Motoring. For an order of 10 or more, the price is $18 each, and a NAM decal will be included as well. The order must be placed at one time, so please respond here if you are interested and you will be contacted for payment and delivery details. Please have your notification in by the end of November. The calendars will be ordered on December 1st. Congratulations to our newest board members, Lori Wright as Events Coordinator and Taylor Smith as Vendor Liason!! Thanks to all who stepped up to volunteer for the positions, and for those who voted. Lycan Motorwerks has offered our club 2 HUGE gift certificates ($2500 and $5000) good toward custom labor for work done at their shop. You must buy parts through them, but our club discount for parts (35%) still stands. This certificate can only be used for one shot, so it is best for major work. Contact Mike at LYCANCUSTOMS@aol.com if you are interested. These will probably go very quickly. This is a great opportunity for doing some serious work on your MINI!! !